Silicon Valley ageism: Are young people really more innovative? The tech world doesn’t seem to trust anyone over 35. But the truth is a lot more complicated. 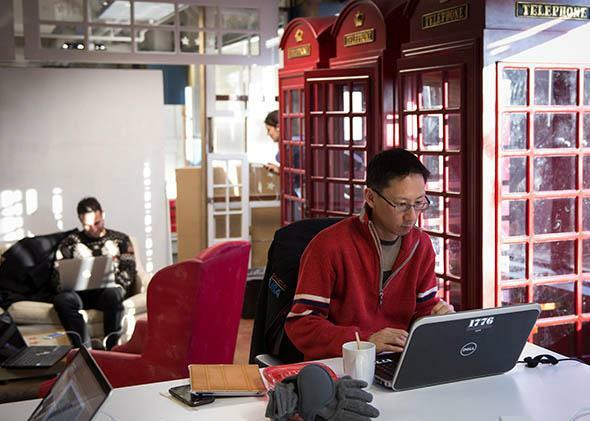 Employees of startup companies work at the offices of the 1776 business incubator in Washington, D.C. Does it matter how old they are? It’s hard to argue with success, and Vinod Khosla has been successful. Khosla, a co-founder of Sun Microsystems and former partner at venture capital firm Kleiner Perkins Caufield & Byers, is today the head of Khosla Ventures. His company has funded some of Silicon Valley’s hottest startups (among them Stripe, Jawbone, Square, and Bitly). In case you were curious: He’s also a billionaire. Few of us have been as right as often as Khosla has. So when he weighs in on what makes a startup successful—and what makes a great founder great—people give him the benefit of the doubt. Journalists have made hay over that quote for years now. Personally speaking, I think (or at least hope) that Khosla said it mostly for rhetorical flourish—to inspire an audience of twentysomethings, rather than to tear down the hopes and dreams of their elders. Regardless, it’s been taken at face value. And by all accounts, the venture capital industry puts its money where Khosla’s mouth is. And the most frustrating part of the story? In the end, having faced these dragons, Scheiber lays down his sword. His prescription for addressing ageism in technology, real or perceived, is tantamount to acceptance. “But even if it’s true that the young are more innovative,” he concedes, unnecessarily, “it’s not entirely clear that we’d want to elevate them above the rest of us.” As for the graybeards: “For one thing, there’s something to be said for marginal improvements.” Scheiber’s solution—that we focus less attention on risky innovation, and more on developing a German-style industrial economy—doesn’t tackle the issue of ageism (or sexism, or cultural bias, or any number of very real discriminatory issues in technology and other American industries). It dodges the question. “Pattern matching,” a term of art borrowed from computer science, is a highbrow spin on profiling. If history’s biggest winners have looked like Mark Zuckerberg, you fund people who look like Mark Zuckerberg. If it just so happens that the bulk of these people are in their early 20s, so be it. These are the kids who were most likely to have been exposed to computers in early childhood, who were hackers in their teens, and who have their whole lives ahead of them now. They have no mortgages, no children, no medical liabilities, and no extraneous commitments. They are more closely connected to the youth demographics their startups will want to chase. They have a real leg up on older, married, or less socioeconomically advantaged peers. And if VCs need to fund companies with unfair advantages, then by definition, they shouldn’t compromise their hit rates in a token bid at fairness. The pattern is the pattern, after all. The young may, indeed, be better at large-scale innovation. Or they may not be. We don’t have enough data to make that claim, and we have plenty of evidence to the contrary. Vivek Wadhwa and his team conducted research into the backgrounds of 652 CEOs and engineering leaders in American companies founded between 1995 and 2005. They found that the average and median age of successful founders was 39. In a subsequent study of 549 successful founders, the average age of male founders was 40, and the average age of female founders was 41. I could argue that this set, too, suffers from sampling issues: It looks only at the successful outcomes, as does the typical VC pattern-matching process. At the very least, however, it confounds the dominant pattern. In doing so, it warrants reconsideration of that pattern. It demands that we feed more data into the machine. But the biggest problem with favoring the young is selective myopia. When we focus all of our attention on the founding moments of Google, Apple, and the rest, we ignore the decades of history that occurred afterward. We read, reread, and then accept as gospel the first chapters in what are often very lengthy stories, with hundreds of protagonists. Think of each company’s history as a series every bit as long-winded, complex, and character-filled as A Game of Thrones (which, by the way, George R.R. Martin published at 47). Google didn’t spring fully formed at a $389 billion market capitalization from the heads of 25-year-old Larry Page and Sergey Brin in 1998. Its founders deserve every bit of credit we’ve accorded them—but so does the whole team in Mountain View, over the entirety of the company’s 16-year history. And even today, the bulk of Google’s revenue comes from AdWords: a product modeled closely on pioneering work by Bill Gross in the late ’90s. (At the time he was charting new ground in keyword-based advertising, Gross was pushing 40.) Apple was founded in the late ’70s, but only in the early 2000s did the firm start to become what it is today. In between the two-Steves-in-a-garage story and today’s $486 billion company were the fruits of 80,000 employees’ labor over nearly 40 years. It takes a village to pick an orchard. To combat discrimination in venture capital, and in technology as a whole, we don’t need to kill our heroes. We shouldn’t deny that many of our idols were twentysomething, white, middle-class males. Instead, we should ask ourselves why those are the only people we idolize. And we should recognize that there’s a much bigger set of possible winners out there. They include founders like 29-year-old Tristan Walker of Walker & Co. and 28-year-old Danielle Morrill of Mattermark. Leaders like 38-year-old Marissa Mayer, 44-year-old Sheryl Sandberg, and 53-year-old Tim Cook. Thinkers like 70-year-old Vint Cerf. Or venture capitalists like 56-year-old Heidi Roizen, whose story about negotiating with Steve Jobs in the 1980s is strikingly relevant in 2014. Plenty of entrepreneurs, engineers, and business leaders in technology can appreciate the wisdom of age, the strength of diversity, and the value of experience. There’s good reason why Noam Scheiber’s article made the front page of Hacker News the other day, earning hundreds of up-votes and comments. But it’s one thing to recognize a problem, and another to do something about it. We need to start by recasting the dominant narrative in our industry’s history. We can keep the founders on their pedestals. But let’s give ourselves—all of us, as a massively productive and cooperative ecosystem—a bit more credit. Founding a company is hard. Scaling a company is even harder. Nobody can do it alone, no matter what age you are.